A dynamic segment is a group of customers defined by conditions in your Sellsy database. The list of recipients from a segment is generated when sending your message and therefore depends on the state of your database at this time. To create a segment, you must save the corresponding search from your contacts or companies lists (customers, prospects, suppliers). To do this, go to one of your lists. Tip: to be sure not to make a mistake, click Reset filters before creating your segment. 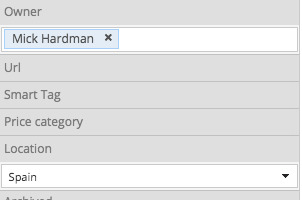 Then apply the appropriate filters to your list (you can also use your custom fields). Click the green button to save your search (which will be your marketing segment). Enter a name for your segment and save. Your segment will now be available when creating an email campaign.